Saturday, February 23, from 10:00 am until 3:00 pm at St. Andrew’s Presbyterian Church, 31 King Street, Picton. Have some seedy fun! Help Move your community’s food future! Talk to Seedy People (about Seeds!) Secure your OWN Food security! Enjoy a friendly atmosphere! Buy Seeds. Swap Seeds. Donate Seeds! Demo’s, Discussions, and Advice from local experts! Raffles! Food! Garden Inspiration! Vegucation! Q & A’s on gardening and seed saving! Visit the Seedy Saturday Facebook page. President Colleen Green opened the meeting by welcoming everybody and speaking briefly about society business and plans for events later in the year. 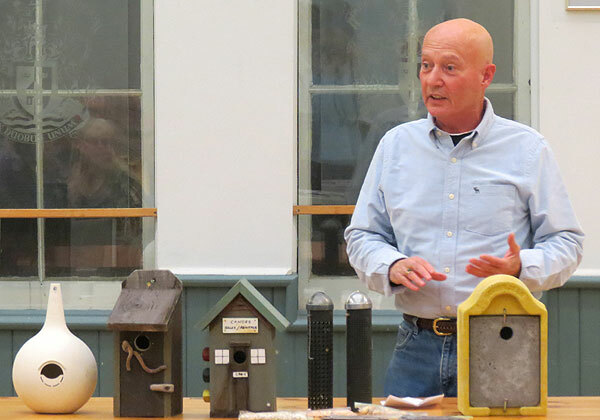 Colleen introduced January’s featured speaker – Kurt Crist – who gave an interesting ‘illustrated’ talk about bird seed and bird feeders with plenty of seed and feeder examples on view. His talk sparked some interesting questions and observations from the members. The most unusual item Kurt presented was a concrete feeder from Germany – the yellow feeder at the end of the table in the picture below. The concrete feeder was the raffle prize for the meeting. 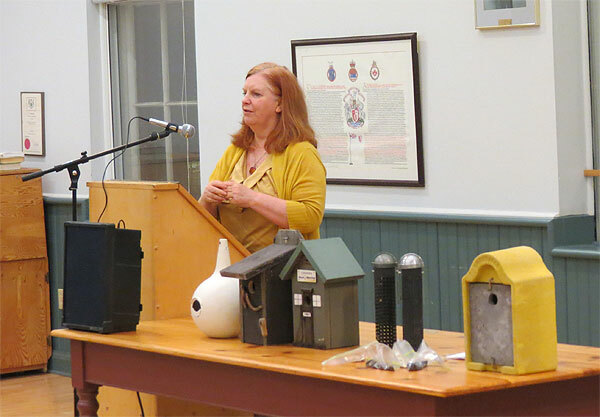 The Mini-show, organized by Gwen Reilly, was a good fit with the featured speaker’s presentation – ‘Any flower presentation featuring a winter bird’. Mini-show entries were judged by the members at large. 1st place went to Mary Jenkins, 2nd place to Kim Katanik-Kuris, and 3rd place to Gwen Reilly. 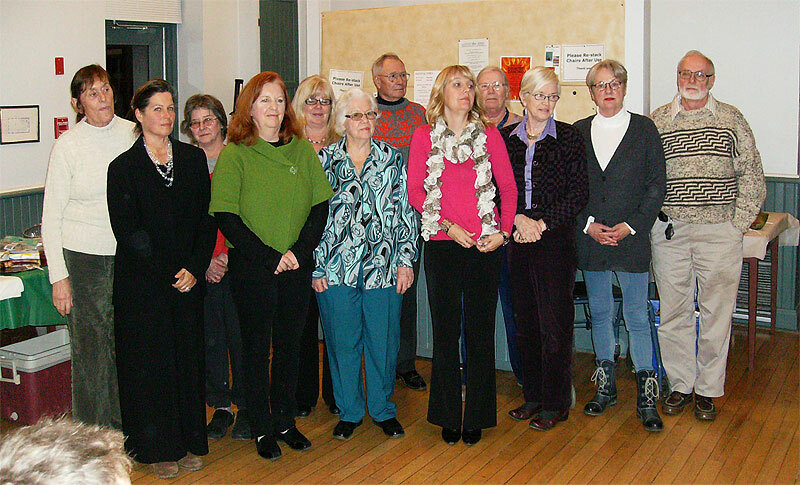 Welcome and welcome back … the new executive elected at the Annual General Meeting. Past president Ingrid Bronson, new president Colleen Green, and some of the newly elected executive at the Annual General Meeting. Festival of Trees – your contribution is requested. Your contributions are requested for the Society’s tree for the Festival of Trees. The Festival of Trees is a fund-raising event organized by the Hospital Auxiliary for the benefit of the PEC Memorial Hospital. We will be decorating a tree with all things horticultural to donate to the silent auction. We need seeds, bulbs, pots, gardening books, tools (new items only please) , anything with a horticultural connection, to decorate our tree. It doesn’t matter if the item is too big to actually go on the tree, it can stand beside it and be part of the package. This year the trees will be on display at the Isaiah Tubbs Resort, West Lake, Nov. 30 – Dec. 1 | Fri. & Sat. 10am-9pm; Dec. 2 – Sun. 10am-2pm. Admission is free and in addition to the Silent Auction for the trees, there will be a Bucket Draw, a Second Time Around Shop Sale and a Bake Sale. Please bring your items to the Oct 31st meeting. Failing that, please contact any member of the executive and let them know you have a contribution. They will advise you where it can be dropped off. For anyone who missed our very successful 2012 Gardeners Gala (or for those who attended), a selection of photographs from the event can be found here. Report on the 2012 Gardeners’ Gala, held on June 9th 2012 at the Crystal Palace. We would like to thank everyone, members, vendors, exhibitors, and sponsors, and especially the members of the public who came out to support us in this major event. We hope everyone involved had a truly great and successful time and we hope to see you again next year. Our theme was “From Colony to Country”, remembering the War of 1812 and its 200th anniversary this year, with more than a nod of respect to the Queen and her sixty years on the throne. The event was opened by Mayor Mertens, our piper Shane Egan, and our very own town crier Walter McGee. The Flower Show had over 160 entries and was co-ordinated by Joyce Young. Thank you to the Judges, Lois and Glenn Bennett, and the Recorder, Joe Kitchen, for all their hard work. Our Sponsors were very generous this year in supplying some wonderful door-prizes. We had a wide range of vendors and we do hope they all had a successful day. We would love to see you all back next year and we hope you feel the same way. Workshop Wizards and Canadian Twig Furniture were unfortunately not able to attend. Our Exhibitors were also varied and interesting. The Victorian Tea Room was organized and run by Colleen Green and her team of helpers and was a great success. Thank you to everyone who loaned us their silver tea-pots to help make it just that bit more special. Terry Sprague, naturalist, speaker and columnist, gave an interesting, informative and well-attended talk on “PEC- Our Natural Gem”. PEC Green Trust held a fund-raising draw. The first prize of an Aiden Haley painting was won by Ken Koyama. Thank you to Derek Delaney for constructing that wonderful cannon for our display. In short a great day was had by all and we are already thinking of the Gala for 2013. 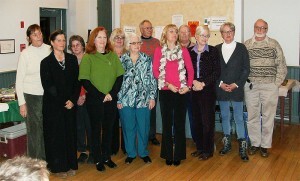 Welcome to the Prince Edward County Horticultural Society’s new web site. Your chance to give back to your community, meet interesting people, and visit amazing spaces. Click here to see available volunteer opportunities related to gardening. The beautiful images posted for mini shows, garden shows, and our meetings are from photographs created by member Bert Jenkins. 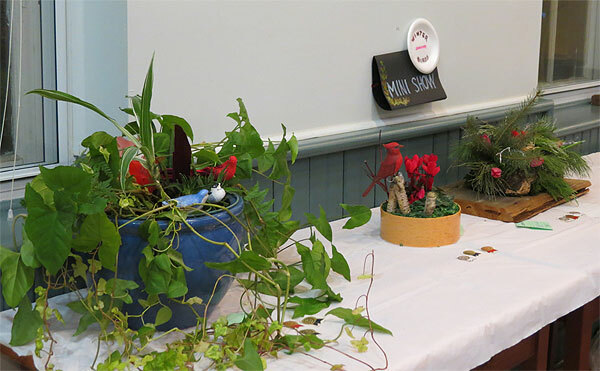 Results from the Flower Show can be found here as a 214kb PDF. Some people think that yuccas are wonderful, and others think they are aptly named.